Before the 2012 season, expectations were admittedly low for the Washington Redskins. Sure, they had just landed the highly-touted Heisman Trophy winner Robert Griffin III to solidify the quarterback position, but that didn’t stop the so-called “experts” at ESPN The Magazine from predicting a 2-14 record for Washington this season. Thankfully, the burgundy and gold were leaps and bounds better than that. Even after losing all of that salary cap space to commissioner Roger Goodell and the NFL mafia and with a paper-thin secondary and injuries to several key contributors, Washington was able to circle the wagons and win the NFC East for the first time since 1999. How did the Redskins go from worst to first for the first time in franchise history? The answer might surprise you. It all started when the team was forced to place long snapper Nick Sundberg on injured reserve after the third-year pro broke his left arm against the New Orleans Saints Week 1. You see, even though Sundberg suffered the injury at the end of the first half, he continued to play the rest of the game with a broken arm. As you might imagine, this impressed the football gods. 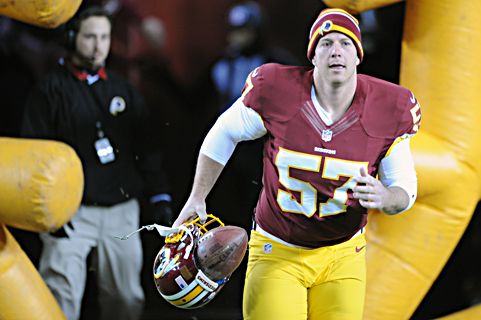 Because the Redskins placed Sundberg on the injured reserve under the newly-established category of “designated to return,” it meant that rather than shutting down the 25-year-old after just one game, they were able to shelve him for eight games and then he was eligible to return to action. What a decision that turned out to be, because, for my money, Sundberg was unquestionably the team’s most valuable player in 2012. Yes, Griffin set team rookie records in nearly every passing category imaginable: completions (258), pass attempts (393), passing yards (3,200), passing touchdowns (20), completion percentage (65.6) and passer rating (102.4), and he also set team records for rushing attempts (120), rushing yards (815) and rushing touchdowns (seven) for a quarterback of any experience level. And then there’s running back Alfred Morris, who set team rookie records in rushing yards (1,613 yards), rushing attempts (335), rushing touchdowns (13) and total touchdowns (13) while also breaking Clinton Portis’ franchise rushing record of 1,516 yards set back in ’05. But Sundberg brought something to this franchise that no one else — RGIII and Morris included — could match. He brought a guaranteed victory each and every Sunday he was on the active roster. With the football gods planted firmly in his corner, Sundberg led the Redskins to a perfect 8-0 record this year when he was in the lineup. Without him, Washington went just 2-6. So with apologies to guys like Griffin and Morris, my vote for the team’s most valuable player goes to Sundberg. While it’s admirable that Sundberg would want to be diplomatic and share the glory, I wasn’t buying it. Thanks to the new injured reserve loophole, Sundberg was able to return to action when his team needed him most. Does he realize how fortunate he (and not to mention his team) is to be able to get to come back? Okay, I get it. He doesn’t want to overshadow his teammates, so the guy is going to continue to try and be diplomatic about it. In Sundberg’s opinion, how did this team magically transform from a 3-6 underachiever to a divisional champ now hosting a playoff game at FedEx Field for just the second time in the stadium’s history? Does Sundberg realize that if his arm had helped up against the New Orleans Saints, this Redskins team might very well have gone 16-0 this season?